Last year our accident attorneys obtained a $71 million verdict for a client who suffered a spinal injury in a car accident and a 41.5 million verdict for a man who was fatally struck by a truck. These verdicts were the second and third highest personal injury verdicts obtained in the entire State of New York in 2017. A total of 6 verdicts obtained by our firm were listed in the 2017 Top New York Verdicts as seen in New York Magazine. 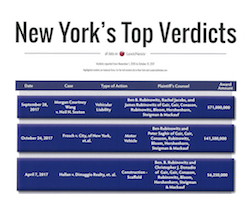 No other firm in New York had that many verdicts listed in the 2017 Top New York Verdicts. Year after year our attorneys are selected by Leaders in the Law as New York's Leading Personal Injury Lawyers. We have more personal injury lawyers selected by The Best Lawyers in America than any other plaintiff's personal injury law firm in New York. Nine of our attorneys have been listed in the Best Lawyers in America as seen in New York Magazine: Stephen Mackauf, Ben Rubinowitz, Jeffrey Bloom, Anthony Gair, Howard Hershenhorn, Richard Steigman and Marijo Adimey have all been recognized as Best Lawyers and each of these attorneys have achieved multi-million dollar recoveries on behalf of their clients in personal injury cases. Throughout the years, our personal injury attorneys have successfully represented individuals and families in New York and New Jersey who suffered injury by the negligence or recklessness of others and we understand how devastating and overwhelming it can be to deal with mounting costs and suffering caused by serious personal injury. We retain the very best experts including accident reconstructionists, biomechanical engineers, medical doctors, forensic pathologists, economists and other experts from the various disciplines involved in the case because every personal injury case requires the plaintiff to prove both liability and damages. Each case has its own set of associated costs, including pain and suffering, lost wages, the cost of care and many other monetary costs and these must be clearly demonstrated. Our trial lawyers will document and preserve any evidence necessary to prove your case and meticulously prepare your case for trial. Gair, Gair, Conason, Rubinowitz, Bloom, Hershenhorn, Steigman & Mackauf was named as Lead Counsel for the explosion on Ann Street resulting in 12 deaths and multiple personal injuries. The case settled for $18,000,000. $17, 250,000 verdict for a man who was rendered partially incontinent as a result of medical malpractice in failing to diagnose a spinal malformation. $16,000,000 settlement an asbestos handler/construction worker who fell 25 feet from a scaffold at the former Pepsi bottling plant in Long Island City. $14,000,000 settlement on behalf of tenants injured as a result of the negligence of Con Edison when a pipe exploded. $12,000,000 settlement for a man who was over radiated by the radiation center where he was treated for cancer. $10,000,000 settlement for a woman rendered blind as a result of being struck by a drunk driver. $ 10,000,000 settlement in Nassau County for a woman who suffered severe personal injury to her legs as a result of the negligence of a bus driver. $9,500,000 million settlement for brain damage to a professional young woman who had surgery for her uterine fibroids but then but then had her endotracheal tube removed prematurely so that she stopped breathing on her way to the recovery room. $ 8,000,000 settlement on behalf of an 18-year old boy in a medical malpractice lawsuit where a physician prescribed the medication Depakote without monitoring the boy’s liver functions despite the known effects of Depakote on the liver. As a result of the failure to monitor the liver functions, the plaintiff sustained complete liver failure requiring a liver transplant and a hepatic encephalopathy resulting in brain damage. $7,000,000 settlement for a 68 year old man who was struck by a Town of Parsipanny bus that turned into him while he was crossing the street. The Judge stated that he believes this was the highest settlement ever in any personal injury case he has handled in the last 20 years in Morris County N.J.
$6,000,000 settlement in Bergen County, New Jersey in a combination motor vehicle accident / medical malpractice case for a 61 year old woman who sustained a herniated disc as a passenger in a motor vehicle accident. She subsequently underwent a neurosurgical procedure to remove the herniated disc during which the surgeon slipped and lacerated the dura of her spinal cord. $5,800,000 settlement for a man who suffered paraplegia as a result of a fall from a scaffold when it was struck by a hi-lo. $5,000,000 settlement in a New York Personal Injury case for injury suffered by the plaintiff when a fire escape on which he was standing collapsed causing him to fall 30 feet to the ground. At Gair, Gair, Conason, Rubinowitz, Bloom, Hershenhorn, Steigman & Mackauf, our NYC Personal Injury Lawyers aggressively work to help you and your family pursue compensation for your injuries. If you have been injured due to the negligence of another, please Contact our firm to discuss your case. Our firm has some of the Best NYC Personal Injury Lawyers. For every consecutive year since 2010 our firm has been named by U.S. News - Best Lawyers ® "Best Law Firms" a Tier 1 Firm for Personal Injury Litigation in New York City. In the face of injustice, the most important thing is someone you can turn to for the best legal advice and representation in the world. 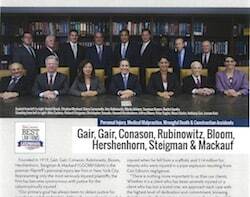 Someone you can trust... that's the hardest working team of Gair,Gair,Conason, Steigman, ,Mackauf, Bloom, & Rubinowitz. This law firm is the creme de la creme, and definitely gives you the best kind attention and care that is so very important when dealing with the difficult aftermath and happenstances of life and health. My case was particularly difficult to solve and stumped another law firm for over 16 months until they finally gave up. Fortunately enough, I was able to speak with Mr.Rubinowitz and Mr.Saghir, and they reassured me that they would try their very best to do right by me, and help me get the justice I deserved, and they did! They went way way way above and beyond the call of duty and were instrumental in changing the course of my Life. I cannot thank them enough for their unwavering hope, help, hard work and determination. If you're in need of legal representation, my recommendation, hands-down, would be the best law firm out there: Gair,Gair,Conason, Steigman, ,Mackauf, Bloom, & Rubinowitz. With them,you will feel confident! Good luck & all the best.